David Ben-Gurion (1886-1973) - The modern nation of Israel was born on May 14, 1948 with the signing of the Israeli Declaration of Independence. 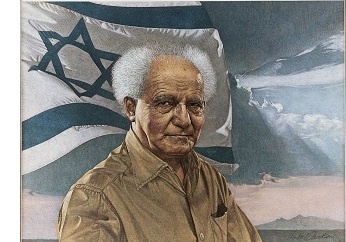 David Ben-Gurion, one of the staunchest advocates of a Jewish state, was the first to sign the declaration and proclaimed its approval upon final draft. The goal of establishing (actually re-establishing from a historical context) a Jewish homeland had been the dream of Zionist Jews since the late 19th-century. Theodor Herzl, a Hungarian Jew, was one of the original proponents of a Jewish state in the Holy Land and founded the World Zionist Organization. With the passage of UN Resolution 181 on November 29, 1947, the possibility of a Jewish nation became a reality. However, Israeli independence immediately set off a firestorm in the predominantly Arab Middle East. One day after Israel became a state, surrounding nations, Egypt, Jordan and Syria, invaded. The brand new country had to scramble in order to defend itself. For years, a Jewish paramilitary organization known as the Haganah, which had been trained by British officer, Orde Wingate, had been operating in the region (many of its members fought for Great Britain during World War II). Ben-Gurion took charge of Israel's defense and molded the Haganah into the Israel Defense Forces (IDF), which operates as the nation's military to this day. They withstood the attack and after nine months, repelled the invaders. Israel was now established and Ben-Gurion became the country's first prime minister. As such, he is referred to as "Israel's founding father". Many believe the recreation of the nation of Israel is fulfillment of Biblical prophecy For example, Ezekiel 36:22-24 says, "'Therefore say to the house of Israel, "Thus says the Lord God, 'It is not for your sake, O house of Israel, that I am about to act, but for My holy name, which you have profaned among the nations where you went. I will vindicate the holiness of My great name which has been profaned among the nations, which you have profaned in their midst. Then the nations will know that I am the Lord,' declares the Lord God, 'when I prove myself holy among you in their sight. For I will take you from the nations, gather you from all the lands and bring you into your own land.'"'"